This Subtask D2 activity was aimed to produce a high quality brochure presenting selected reduced number of Best practice examples. Therefore, input from other activities like C3 and the Task 48 participants have been explored to use it for this activity. In activity C3 first draft of “IEA Quality Engineered Solar Air-conditioning Design Examples: A companion to the IEA Solar Cooling Handbook” has been prepared including three solar cooling technologies: a small-scale single-effect absorption chiller system in Austria, a medium-size single-effect absorption chiller system including DHW production in France and a large-scale double-effect absorption chiller system in Australia. Additional 9 further best practice examples were collected from the Task 48 participants, thus a total of 12 projects are summarized in the best practice brochure. The selected solar cooling projects presented in the brochure represent different applications like office buildings (6), school/institute buildings (4), commercial buildings (1) and residential buildings (1). The projects are located in North America (1), Europe (4) and mostly in South-East Asia (7). The cooled floor spaces of these buildings range between 240 m² up to 11,000 m². The best annual electrical COPel are between 6 and 25, which is an average value of about 12.9. The specific installed system costs are 7,300 EUR/kW for small-scale systems and in average 1,900 EUR/kW for large-scale systems. The Task 48 D4 activity focuses on roadmapping process and benefits strongly from the published ‘Energy Technology Roadmaps a guide to development and implementation’ of International Energy Agency in 2014. Giving advice for developing roadmap focussing only on solar thermal cooling technology would not lead to the entire picture while the most roadmaps identified address all other promising application of solar heat. The authors of D4 report structured the document as follows. CHAPTER 2 – Review process This chapter is a result of the screening process of existing roadmaps for solar heat technologies. Seven roadmaps from different countries have be identified and taken for analysis with respect to the applied methodology and topics. Furthermore there is information about renewable energy and other policy incentive schemes. A study from United Nations Environment Programme (UNEP) defines five categories and the 20 policy instruments and assess qualitative their relative technical and cost effectiveness and comments on limitations, strengths and special cases. 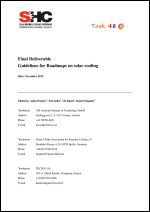 CHAPTER 3 – Guideline for Roadmapping The guideline of roadmapping is strongly based on the published a new edition on ‘Energy Technology Roadmaps a guide to development and implementation [IEA Guide]. This guide is taken as a useful source to elaborate a guide for SHC Technology roadmaps in the framework of SHC Task48. This guideline addresses four different phases for developing a roadmap; i.e. a)	Planning and preparation, b) Visioning and target definition phase, c)	Roadmap development and d)	Roadmap implementation and adjustment. All four phase are briefly described and additionally selected examples from three different existing roadmaps are presented.